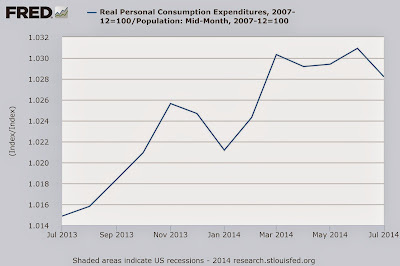 Real personal consumption expenditures per capita grew a lot from July to August (0.5 percent in one month; annualized that's 5.7 percent). The year-over-year growth is 1.9 percent; about a quarter of that growth occurred in one month. Over the prior three years, real PCE per capita had been growing 1.3 percent per year. Whether the Affordable Care Act lives up to its name depends on how, or whether, you consider its consequences for the wider economy. Millions of people pay a significant portion of their income for health insurance so they and their families can get good health care when they need it. The magnitude of their sacrifices demonstrates the importance that people ascribe to health care. The Affordable Care Act attempts to help low- and middle-income families avoid some of the tough sacrifices that would be necessary to purchase health insurance without assistance. But no program can change the fundamental reality that society itself has to make sacrifices in order to deliver health care to more people. Workers and therefore production have to be taken away from other industries to beef up health care, or the workforce itself has to get bigger, or somehow people have to work more productively. Although the ACA helps specific populations by giving them a bigger slice of the economic pie, the law diminishes the pie itself. It reduces the amount that Americans work, and it makes their work less productive. 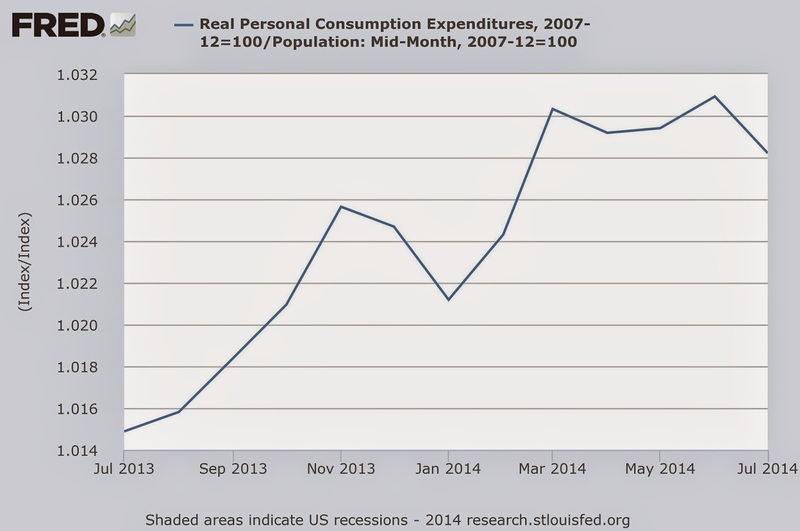 This slows growth in both personal income and gross domestic product. In further expanding the frontiers of redistribution, the ACA reduces the benefits of employment for both employers and employees. Employers that don't provide health insurance are either subject to large penalties based on the number and types of employees that they have, or are threatened with enormous penalties when they get the opportunity to expand their business. About a quarter of the nation's employees, more than 35 million men and women, currently work for employers that don't offer health insurance. These tend to be small and midsize businesses with employees who already make less than the average American worker. The result of penalizing businesses for hiring and expanding is going to be less hiring and expanding. Another sixth of the nation's employees—almost 25 million people—are in a full-time position that makes them ineligible for the law's new and generous assistance with health-insurance premiums and cost sharing. They are ineligible for subsidies simply because they are working full time and thereby eligible for their employers' coverage. Because the only ways for them to get the new assistance is to move to part-time status, find an employer that doesn't offer coverage, or stop working, we can expect millions of workers to make one or more of those adjustments. Most people wouldn't give up working merely to qualify for a few thousand dollars in assistance. But it is a mistake to assume that nobody is affected by subsidies, because there are people who aren't particularly happy with working, planning to leave their job anyway, or otherwise on the fence between working and not working. A new subsidy is enough to push them over the edge or to get them to stop working sooner than they would have otherwise. The law has effects that extend well beyond the employment rate and the average length of the workweek. People, businesses and entire sectors will jockey to reduce their new tax burdens or enhance their subsidies. Their adjustments to the new incentives will make our economy less productive and stifle wage growth, even among workers who have no direct contact with the law's penalties and subsidies. The "29er" phenomenon is a good example of how the law harms productivity. Because ACA's "employer mandate" requires firms with 50 or more full-time workers to offer health plans to employees who work more than 30 hours a week, many employers and employees have adopted 29-hour work schedules. This is not the most productive way to arrange the workplace, but it allows employers to avoid the mandate and its penalties and helps the employees qualify for individual assistance. All of this, and much more, exacerbates the societal problem that the economy cannot expand its health sector without giving up something else of value. A complex law like the ACA has a few provisions that encourage work, such as counting unemployment income against eligibility for health assistance. But the bulk of the law overwhelms them. The ACA as a whole will have the nation working fewer hours, and working those hours less productively. I estimate that the ACA's long-term impact will include about 3% less weekly employment, 3% fewer aggregate work hours, 2% less GDP and 2% less labor income. These effects will be visible and obvious by 2017, if not before. The employment and hours estimates are based on the combined amount of the law's new taxes and disincentives and on historical research on the aggregate effects of each dollar of taxation. The GDP and income estimates reflect lower amounts of labor as well as the law's effects on the productivity of each hour of labor. By the end of this decade, nearly 20 million additional Americans will have health insurance as a consequence of the law. But the ultimate economywide cost of their enrollments will be at least double what it would have been if these people had enrolled without government carrots and sticks; that is, if they had decided it was worth spending their own money on health insurance. In effect, people who aren't receiving assistance through the ACA are paying twice for the law: once as the total economic pie gets smaller and again as they receive a smaller piece. The Affordable Care Act is weakening the economy. And for the large number of families and individuals who continue to pay for their own health care, health care is now less affordable. Mr. Mulligan is a professor of economics at the University of Chicago and the author of the new e-book "Side Effects: The Economic Consequences of the Health Reform" (JMJ Economics, 2014). Our economy uses a lot less labor than it did 10 years ago, and for good reason people are interested in the relative importance of supply and demand factors for explaining what happened to the quantity of labor. Naturally, a supply-demand decomposition exercise is enhanced by looking at both the quantity and price of labor, also known as the wage rate. That's why my book on the recession starts off with various indicators of wage rates and their dynamics (see chapter 2 beginning on page 9). A reduction in labor supply could reduce the quality of labor, with workers putting in less effort, or doing less to maintain their skills, or become less attached to the labor market. This tends to reduce cash earnings per hour because each hour is less productive. These have been major factors in the analysis of women's wages, where most economist believe that women's hourly earnings increased as a consequence of supplying more (see Becker 1985, Goldin and Katz 2002, Mulligan and Rubinstein 2008, and many others). See also some of the literature on unemployment insurance such as Ljungqvist and Sargent's paper on European unemployment. A reduction in labor supply or demand could increase the average quality of labor through a composition bias. See p. 17ff of my book and the references cited therein. Because of fringe benefits, cash hourly earnings are not the same as employer cost. As employer health insurance expenditure has been growing over time, the growth of cash hourly earnings has substantially under-estimated the growth of employer cost. The Incidence of Supply and Demand Impulses. Labor economists have also long studied the incidence of supply and demand impulses: that is, the effects of supply and demand factors on both wage rates and the quantity of labor. The consensus is that: (a) labor demand is more wage elastic than labor supply and (b) labor demand is even more wage elastic in the long run than it is in the short run. Suppose that the reduction in the quantity of labor were 50% due to demand factors and 50% due to supply factors, and that we had overcome all of the measurement issues cited above. Result (a) means that wages would fall in the short run, because supply shifts translate more into labor quantity than into wage rates while, in comparison, demand shifts translate more into wage rates than labor quantity. In this example, it would be wrong to conclude from reduced wage rates than supply is less important than demand for explaining the change in the quantity of labor. To put it another way, if we found that wage rates (properly measured) were constant, but didn't know the relative contribution of demand and supply factors to the quantity change, result (a) tells us that the majority of the labor quantity change was due to supply factors. With a labor supply elasticity of 0.5 and labor demand elasticity of -3 (reasonably conservative short run estimates), the constant wage rate result means that 86 percent of the quantity change was due to supply factors and only 14 percent due to demand factors. In the long run, labor demand is even more wage elastic, and the share attributable to labor supply is even closer to 100%. To put it yet another way, if it were true that labor demand explained the majority of the change in labor quantity, then employer costs (properly measured) would have fallen dramatically. Despite all of these lessons from labor economics, blogosphere economists attempt to dissect the hourly cash earnings data to perhaps find a small and probably ill-timed reduction and jump to the conclusion that labor supply shifts have made a trivial contribution to the change in labor quantity. The payroll report shows +142k (change from July to Aug), which seems low, but note that it excludes self-employed and agricultural workers. If you add those, it's +299k primarily because (seasonally adjusted) agricultural employment increased so much. per person, it was less in July than each of the prior 4 months. Apple refused to list my book for $3.00 -- they listed it at $2.99. Amazon went with the $3.00 price for about a week, and then cut it to $2.99. BN is still charging $3.00.